ur worship experiences at Custer Road UMW are celebratory, thoughtful, and engaging regardless of the worship service you attend. We offer two traditional worship services, in our Sanctuary, with music usually led by the Revelation Youth Choir at 8:30am and our Adult Chancel Choir at 11:00am. If you prefer a modern worship service, meet us in The Venue at 9:45am. You'll enjoy a modern worship experience with uplifting music from our Modern Worship Band. Holy Communion is served each week in the Prayer Room (on the first floor behind the Sanctuary) from 9:25-9:50 a.m. and 10:40-11:05 a.m.. Holy Communion is only served in worship in the Sanctuary and The Venue on the First Sunday of the month. Wondering what our worship services are like? Watch our latest service here. April 21, 2019 - New Evidence from Custer Road UMC on Vimeo. April 21, 2019 - 11:30AM Full Worship from Custer Road UMC on Vimeo. Easter Sunday Morning and the final sermon in the "CSI: Jerusalem" sermon series. A man has been put to death, executed by the State. But what if he was really innocent? Eyewitnesses abound, but in a world full of political corruption, extortion, bribery and deceit, who can be trusted? Join us as we examine the crime scene, written transcripts of eyewitness testimony, and the forensic evidence. You’re a member of the CSI: Jerusalem team now! If you’re joining us for the first time, then welcome! We’re thrilled to have you! At Custer Road UMC you can expect a celebratory, thoughtful, and engaging worship service. When you arrive, there is parking around the Sanctuary, with special spaces for visitors on the north side of the Sanctuary. (Ample handicap parking is also available.) If those spots are full, there is more parking immediately across the street, with police officers there to help you cross safely. We encourage you to come as you are. 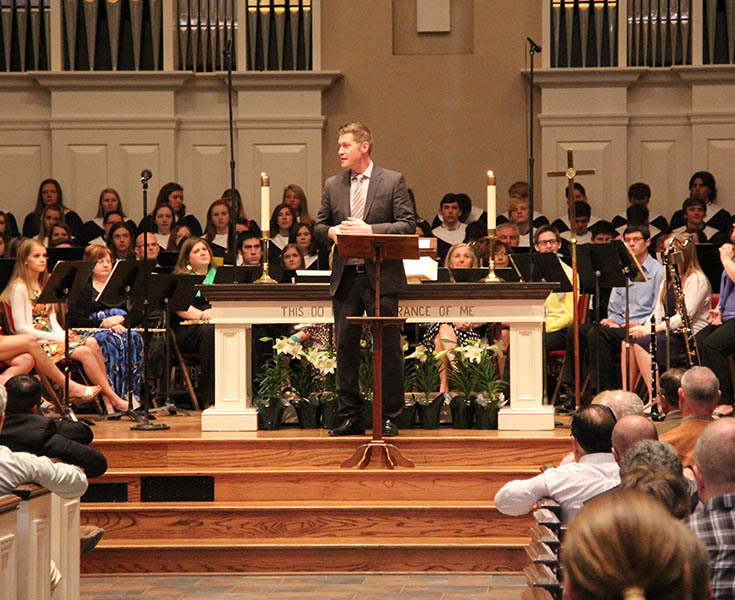 Most people attending our Traditional Worship service in the Sanctuary wear business-casual attire; some wear suits, ties and dresses and others wear jeans or shorts. In our Modern Worship service in The Venue, most people wear casual clothes. Just remember, God sees our heart and that’s what He cares about; it’s not about the style of clothing we choose. If you’re planning a visit, we’d love to know! We’ll even arrange to have someone meet you at the door and show you around. Click here to send an email to Kelly Graeber, and let her know when you’re coming.